Aiutiamo il PAM a combattere la fame nel mondo. Con 35 euro all'anno permetti ad un bambino di mangiare e andare a scuola. This is a simple MP3 player for the PSP. With the display set to minimum brightness the battery should last at least 9 hours. With the display off the battery should last at least 11 hours. LightMP3 is ditributed under GNU General Public License. You can find LightMP3 also on Google Code. You can also discuss about LightMP3 on this forum. You can find skins for LightMP3 here. -Added: Bookmark function (for audiobook): press L+Circle while listening to a track. There's a new option in the settings file. The default is 0, if set to 1 the psp will shut down after creating a bookmark. The next time you'll start LightMP3 will ask you if you want to load the saved bookmark. Added a setting to disable the "display off on hold". If you use Hold+ please disable this in LightMP3. -Fixed: Strings are limited inside the menu area. -Fixed: Some crash in the Media Library. -Added: Cover displayed in file browser and in Media Library (stay 0.5 seconds on an item). 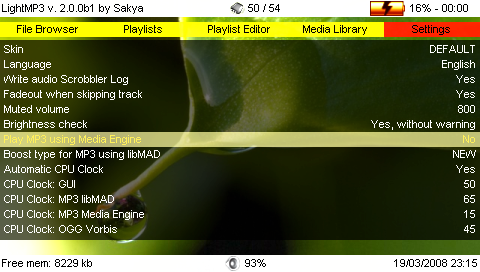 -libMAD is now streamed, no more file size limit (based on Ghoti MusicEngine.c in pspStacklessPython). -Added volume boost to ATRAC3/ATRAC3+ format. 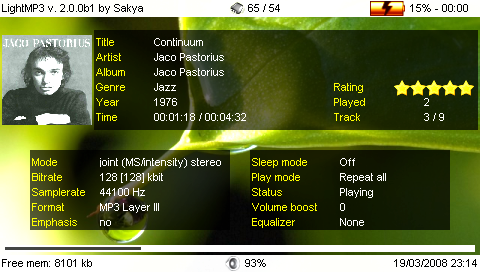 -Added volume boost to MP3 format via Media Engine. -Added: Sleep mode (press TRIANGLE while playing a track). The psp will shutdown after the track or playlist/directory. -Fixed: Cracking sound when quitting while playing a track. -Fixed: Some mp3 with "strange" ID3 made the app freeze. -Fixed: Some mp3 displayed wrong ID3v2 informations. -Added: Automatic cpu clock based on filetype. -Fixed: Directories are now listed before files. -Fixed: Conflict with Music prx (the module is stopped and unloaded at startup). NOTE: in kernel 3.71 the bus cannot be properly set, so it's stuck @ 95Mhz. -Added: the app saves the volume level when exiting and restores it next time is started. -Fixed: USB connection problem, no more need to copy prx from your flash0. Note: the equalizer won't work with OGG Vorbis file. -Fixed: volume up and down with remote controller didn't update volume bar. -Fixed: display brightness is restored when you quit. -Added: HP and RM on first line if headphones and/or remote controller are plugged. -Added: Fastforward (no rewind, sorry). Press right and left to raise and lower playing speed. -Fixed: if you delete .scrobbler.log with LightMP3 running (activating USB), the file is recreated. -Fixed: display didn't turn on (if turned off with START) when playlist or directory finish. -Added: Audioscrobbler log (disabled by default look a the settings file). -Added: you can switch from old or new volume boost method. Check the settings file(it's commented). -Added: the app is a little lighter, you can lower cpu 2/3 mhz more (if not using EQ or volume boost). -Fixed: The app now correctly exits pressing HOME. -Fixed: with HOLD the analog was still working. -Pressing NOTE in playlist editor will play the current playlist. -Fixed: current playlist is cleared at startup. -Fixed: crash when listening or adding to playlist directory with subdirs. 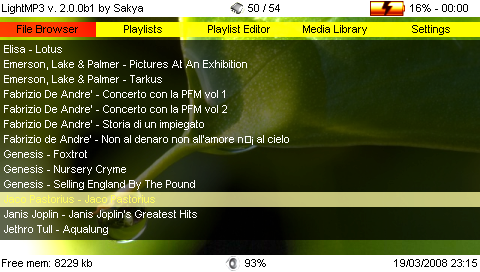 -File browser now filters files, showing only mp3 and m3u.